We offer 100% pure amber attar, which is prepared natural absolutes. It doesn't contain alcohol and harmful chemicals. Amber attar has a rich and sweet fragrance appreciated, which is soothing as well as stimulating. This gorgeous attar is used as the base in perfumes, cosmetics and perfumery products. It is also believed that amber attar has properties. We offer 100% pure amber attar, which is prepared natural absolutes. It doesn't contain alcohol and harmful chemicals. Amber attar has a rich and sweet fragrance appreciated, which is soothing as well as stimulating. This gorgeous attar is used as the base in perfumes, cosmetics and perfumery products. It is also believed that amber attar has aphrodisiac properties. Hina is a blend of the perfumes produced from natural herbs and spices, aromatic gums and resins. Having a rich musky odour and owing to sandalwood oil base, can provide an oriental note to the perfumery compounds in which it may used. Bakul attars are prepared from the absolutes obtained from star-shaped Bakul flowers. It is among the most preferred attars due to its soft and floral fragrance. Due to this, this attar is used in the preparation of perfume blends and exotic scents. 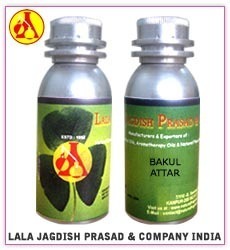 Bakul attar is used in sacred Hindu ceremonies when seeking blessings. It is a fragrance made more especially for women, but at times it is also worn by men. Made available in exclusively designed bottles of different ml sizes, these attars have a unique blend of floral and musk, that makes it very sweet and rich in composition. We offer 100% Natural and Skin Safe Black Musk Attar is is quality processed using hydro distillation of herbs, flowers and spices that is followed by the maturing stages. The quality Black Musk Attar hence generated is used for providing solutions for joint pains, acne as well as skin problems. Other than this, it is also used as beauty care in creams and lotions. The Chameli Attar is being prepared from Jasmine Grandiflorum Flowers, one of the most versatile flowers, being used for its lovely floral smell possesses properties Increases vitality and creates a strong protective energy against disturbing influences. This attar is used in headaches and for getting relief from a heavy head feeling which result from excessive noise and general botheration. This attar is also used in the worship of Lord Krishna. It is used for giving fragrance to the water with which Lord Krishna is given bath with. In all the rituals connected with Lord Krishna this is extensively used. The Chameli Attar is being prepared from Jasmine Grandiflorum Flowers, one of the most versatile flowers, being used for its lovely floral smell possesses Aphrodisiac properties Increases vitality and creates a strong protective energy against disturbing influences. This attar is used in headaches and for getting relief from a heavy head feeling which result from excessive noise and general botheration. This attar is also used in the worship of Lord Krishna. It is used for giving fragrance to the water with which Lord Krishna is given bath with. In all the rituals connected with Lord Krishna this is extensively used. The Champa Attar is extracted from the very beautiful flower also known as Champaca (Michelia champaca), of Indian Origin. The flower is rare species, only found in India. The flower of Champa is a replica for Romance for its sweet smelling and fragrance. Being high in therapeutic effects, the Champa Attar, is useful in treating gonorrhea, Renal Diseases, Diseases of Head, Headache, Sub-acute rheumatism, Vertigo, Gout, etc. Ingredients: Champa essential oil, Indian White Sandalwood essential oil. Made from Golden Champa flowers, closely related to Magnolias. The Champa Attar is extracted from the very beautiful flower also known as Champaca (Michelia champaca), of Indian Origin. The flower is rare species, only found in India. The flower of Champa is a replica for Romance for its sweet smelling and aphrodisiac fragrance. Being high in therapeutic effects, the Champa Attar, is useful in treating gonorrhea, Renal Diseases, Diseases of Head, Headache, Sub-acute rheumatism, Vertigo, Gout, etc. Choya Ral is being produced by heating the bark of a Wild Tree, in the special earthern ware and when comes out the note the perfumer is looking starts, the burnt bark, the carrier oil or base oil such as Sandalwood, Paraffin etc. is added and the extract thus, is collected through a small spout, drop by drop - The same is vey useful in incense business, hawan samagri, etc. The Dehnul Oud Attar is being extracted from the Brown Semi Solid Tree to Aquilaria agallocha, (Having Flash Point of 170). The trees are gown in its natural habitat, in Assam (India) , where you can find wild and naturally occurring trees. Frangipani fund in India, has a smell of citrus to start with, which resembles faintly the unusual scent of pomelo blossoms. The Frangipani Oil, is in great demand for its wonderful usage in massage & aroma therapies. Gul Hina Attar (Lawsonia Inermis) is being prepared from the Flowers of Indian Origin, by Steam/Hydro Distilled Method. Gul Hina Attar is liked for its sweet scent and essence, for which it is said to be the flower of paradise. The typically prepared attar lasts for more than 8 to 10 hours with the property of being completely safe for all types of skin. Ingredients : Gulhina (Henna flower) essential oil, Indian White Sandalwood essential oil. Lala group is the leading manufacturers, producers, and distillers of Gold Mohar Attar in India. Goldmohar is being extracted from one of the rare flower found in the country of India. The usage of Gold Mohan Attar is being used in various cosmetic and creams, for its effect of sun screening, and toning of skin. It is also used in various creams for creating lather and foaming. Botanical Name : Painciana Regia. Besides in great demand for its sweet smell, Har Singar Attar has various usages for its therapeutic effects, it has been found effecting in Jaundice, Malaria, abdomen disorder, mental retardation, and even paralysis. With the Usage of more than 75 Herbs, these attars are extracted from the various rare herbs found only in India. This is one of the specialities of India, as no other country in the World produce Hina (or Mehandi, as popularly known) Products, Hina Oils and Hina Attars. Botanical Name : Lawsonia Inermis. The rare attar has a spicy, warm, woodsy, earthy and exotic aroma. This attar is prepared by blending different herbs, spices and flowers. Extracted from Agarwood, Hina Oudhi Attar has a spiky, woodsy & powerful scent. The rare attar is renowned for spiritual enlightenment, spiritual perfection, Divine attunement, protection and facilitating deep meditations. It is used in number of aromatherapy products and finds application in various perfumeries.